I think it's clear that the star of this post is my new pale patent pink leather bag from LODIS. that fact that it is patent. This season I have been intrigued by all things shiny and eye-catching. about this asymmetrical skirt from shop AKIRA, that I transformed into a hi-lo skirt instead. detachable collar. It is the perfect quirky touch to any outfit. PPS- I have updated Shop Flashes of Style! Lots of lovely vintage pieces available. That shirt reminds me of Minnie. So simple and so feminin as usual, love it. YESSS. maroon and red together is like my favorite thing right now. diggin' it. 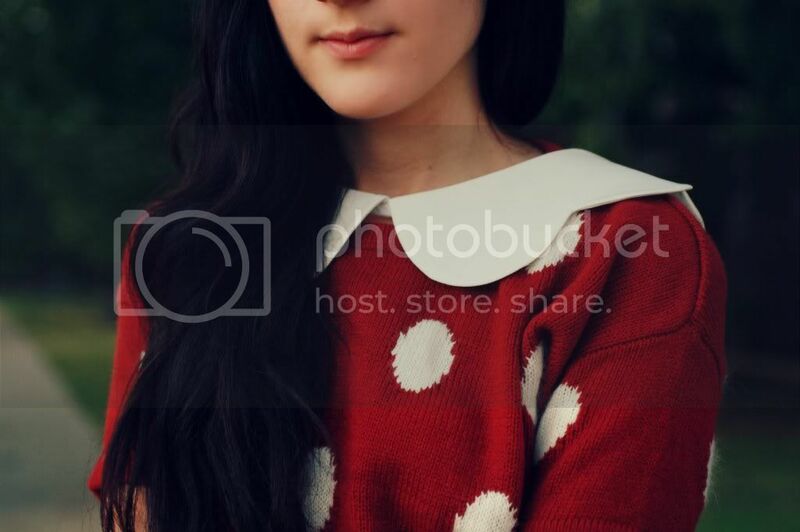 I've been seeing that F21 dotted sweater on a lot of girls recently. You look super cute! 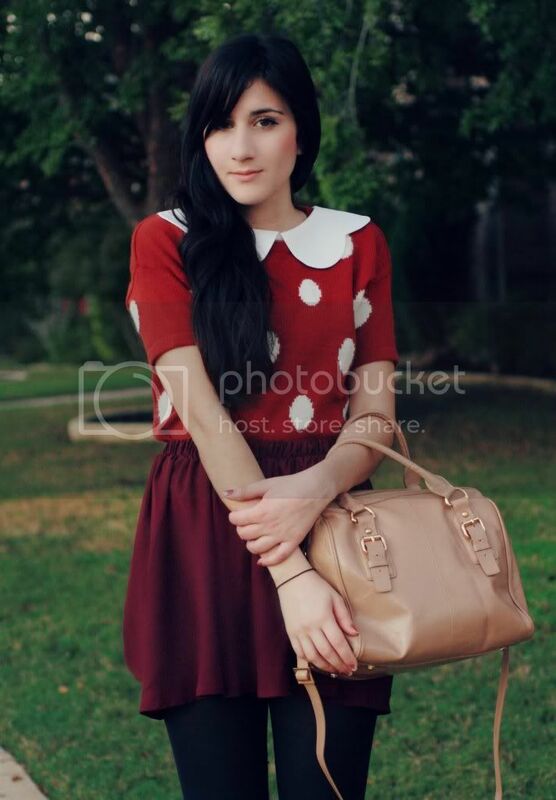 Love the wine red polka dot sweater, so cute! That sweater is the cutest! such a darling sweater - love that bag, too! You look so cute and so retro! Love your sweater top! Love this!! That bag is gorgeous!! And what a smart idea to just twist your skirt a bit, it makes a whole new piece! you look adorable i love the sweater. Love the jumper & collar. The top looks so sweet! Bonnie, your skin is flawless! I love your make up here. a detachable collar...seems so genius. you look beautiful, missy! detachable collar...genius. Cute! I have been looking for a good pink bag, and yours is so pretty! 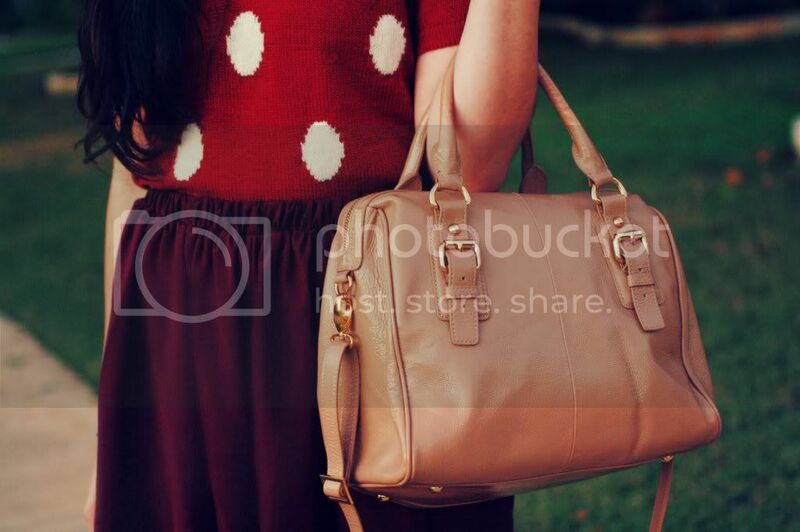 This fishtail skirt is so pretty and you have gotten yourself a great bag there! Yay for being on FB! I will like you right away (my real name is Robin). Have a great day! YAY its the most amazing collar ever! and of course anything polka dots is.. <3 <3 so cute! I love the detachable collar!! I would never have even guessed! May have to invest in one! And loving the polka dots! Too cute! Love this bag, darling!! The skirt is pretty amazing as well! Looking gorgeous! That bag is AMAZING! I'm in love. Pale pink is such a gorgeous colour for fall. LOVE your sweater, it's really cute! i adore your top! you look so cute! I love your jumper! Looks so comfy :) Glad to be back and reading your blog! This outfit is so well put together!! I am loving the burgundy with the bright red top. People calling sweaters 'jumpers' is throwing my Canadian understanding off, haha. I keep thinking "she's not wearing a jumper!" Love the cut on that skirt! You look lovely!!! Amazing skirt! Love that the collar is detachable! Would look lovely in so many other tops, cute bag! I thought I hated patent... but I love this. this is so amzing !!! 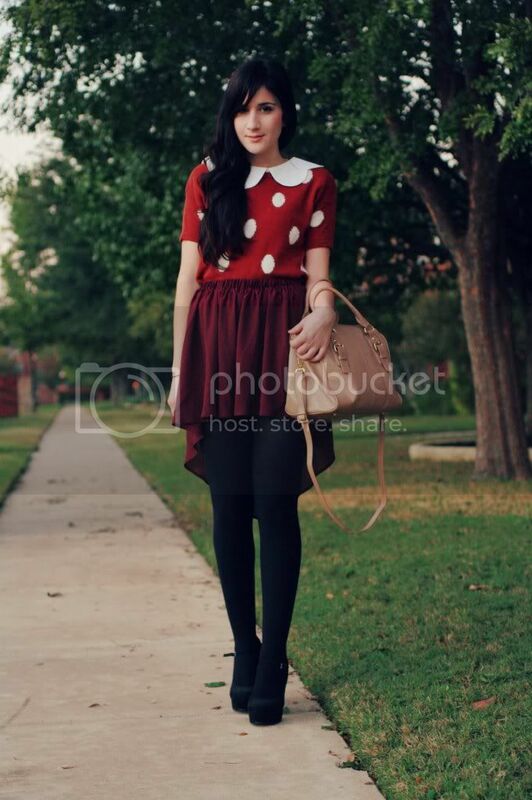 I love that polka dot top with the collar. Amazing. That sweater is so Minnie Mouse. That top is the perfect touch to the outfit! It makes it just a little bit whimsical and a whole lotta adorable! Once again, a perfectly cute outfit from you ! I really like your skirt- the coulour and the cut are perfect ! adorable outfit! thanks for your lovely comment, i've just started following your blog and i'd love it if you wanted to follow me too! love this! that top is adorable! and completely adore the skirt! The hi-low skirt is the perfect edge to contrast those polka dots. A little minnie mouse-ish but so cute nonetheless! LOVE that skirt... You look super cute in the outfit! Ahh can I have that collar too? Love it! You look gorgeous like always my dear. I love your blog ! Very nice skirt and good idea. Very cute outfit! Especially skirt! 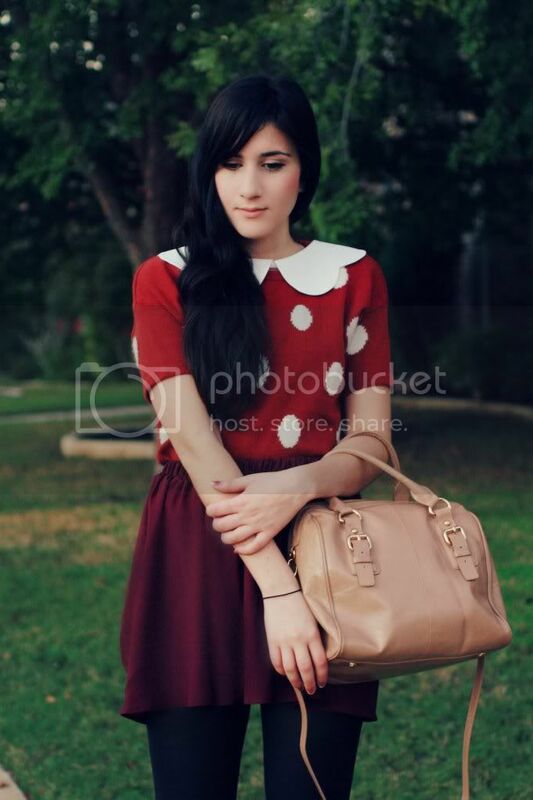 adore the sweater and skirt combo, the red and burgendy colors look beautiful together, and that gorgeous bag is stunning-perfect colors going on! Crazy Amazing dots! Where is this shirt from?? great bag love the top tpoo! Adorable and so damn chic! I've been obsessed with high-low hemlines for a couple of seasons now, and I find that they add an element of intrigue and drama that a regular shaped hemline sometimes lacks. I'm also a fan of shiny items, and sequins in particular are my weakness! damn your are so pretty !